Designed with a spacious bi-level floorplan and an elevated forward section, fifth wheels are comfortably hauled by most specially equipped pickup trucks. 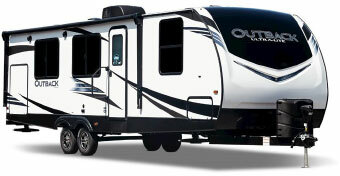 Rich & Sons RV Headquarters stocks models from all major brands in a variety of weights and sizes. Travel Trailers from major brands like Highland Ridge, Keystone and Wildwood are excellent for fuel-efficient trips for the whole family. Easily towed behind an SUV, pickup or minivan, Rich & Sons RV Headquarters will provide the perfect option for your next vacation. When your next trip’s destination is merely a starting point for adventures on your motorcycle, ATV, snowmobile or Jet Ski, Rich & Sons RV Headquarters has you covered with new and used toy haulers from Fuzion and Impact among others. Rich & Sons RV Headquarters first opened its doors in December 1972. Owner. Richard Hiser, his daughter, Lana, and son-in-law, Chuck had a dream: to bring the RV Lifestyle to the people of central Nebraska, by providing them with an affordable variety of RVs, a top-notch Parts and Service Department and unsurpassed Customer Service. They started with only a dozen RVs a small parts room and 2 service bays. Over the years, the dealership grew, adding more and more units to the lot. Rich passed the reigns on to Chuck and Lana in 1987, where they oversaw the addition of more units, a larger parts department and more service bays. In 2007, Chuck and Lana retired and passed the reigns on to their two sons, Tony and Nick. Tony and Nick grew up at Rich & Sons, playing here as boys, washing campers, working the parts department as teenagers and eventually learning the business as adults. Tony oversees new and pre-owned RV Sales and Finance, and Nick oversees Parts, Service, Warranty and Accounting. Our dealership has grown by leaps and bounds in the past few years. 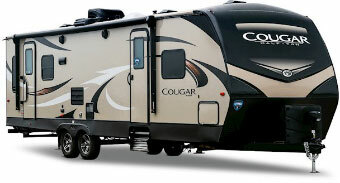 We now have a selection of over 250 RVs on our lot. We also have one of the Midwest’s LARGEST Indoor Showrooms and Service Departments. WHY SHOULD YOU BUY FROM RICH & SONS? We have been a family owned and operated business for 45 years. We have upfront and fair pricing inside every unit AND on our website. Our Parts Department has over 10,000 in-stock parts. If we don’t have what you need, we can have it shipped to you in as little as 1 day. Our Service Techs are highly experienced in diagnosing and repairing any problems you may have with your RV, getting you back to camping as quickly as possible. 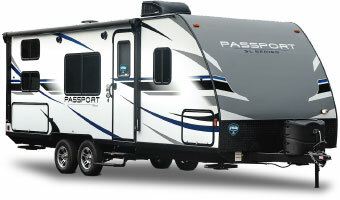 We have a full time Warranty Manager who will take care of any warranty claims on your new RV for you. Our employees take pride in the products and services we offer and truly care about our customers. Our owners invest in our growth by providing the staff with continuous training in product knowledge and customer service. We enjoy giving back by supporting many agencies and businesses in the surrounding communities. At Rich & Sons, we pride ourselves in providing our customers with the industry’s best brands, offering all the most popular amenities and floor plans. Experience has taught us which manufacturers and which brands will stand the test of time in terms of delivering comfort, durability and value for our customers. VARIETY. AFFORDABILITY. UNSURPASSED CUSTOMER SERVICE. Just a few reasons why we’re known as The Midwest’s BEST RV Experience.! Made the deal from Iowa, easy to work with, great service! Beautiful coach! Can’t say enough about this experience! So happy! It was so worth the 7 hour drive! The staff is great and very helpful! This place has nothing to hide and post prices for all to see unlike most dealers in Nebraska. This place is great and highly recommend. Excellent honest service! We stopped here for some parts and they gave us exactly what we needed, friendly service too. Above and beyond. Very friendly and helpful staff, will definitely be doing more business with them. These folks are awesome. Wont buy from anywhere else. Friendly staff that have always done excellent work on my camper. What a great service center. Had an acccident with AC. Had one, worked us in on the road. Nice nice people, large parts store. Also RV sales. Great staff. Big selection of campers.